EQ100, EQ 300, EQ 500 - A bunch of hair approximately 40cm long and half the thickness of your little finger. EQ 200 EQ 401, EQ 402, EQ900, EQ 901 - A bunch of hair 40cm long and the thickness of your little finger. EQ 101, EQ 120, EQ 130, EQ 140, EQ 150, EQ 160, EQ 700, EQ 800 - A bunch of hair 12cm long and half the thickness of your little finger. EQ 110 - A bunch of hair 45cm long and half the thickness of your little finger. EQ 600 - A bunch of hair 40cm long and the thickness of your middle finger. What is the best way to send hair? For larger bunches, please secure the top of the bunch with a rubber band or similar. Avoid tying knots of any kind. Smaller bunches can be placed in a clip seal bag. Post in a padded bag, tough bag or heavy gauge envelope. Avoid standard envelopes as they are prone to getting jammed in mail sorting machines. Obtain a tracking number for the parcel if you have any concerns. Damian will immediately send a confirmation email upon reception of any hair. Can I use hair from more than one horse? Yes, it is not a problem to combine hair from more than one horse. See our guide to blending different colours below. Can I use mane hair? I do prefer tail hair if available as the hairs are thicker and longer than those in the mane. Mane hair is suitable for any of the pendants. Can I bring hair to your workshop? Yes. If you happen to live in Tasmania or lucky enough to be visiting, please contact Damian to arrange a time to drop in. Is the hair protected or treated? No. 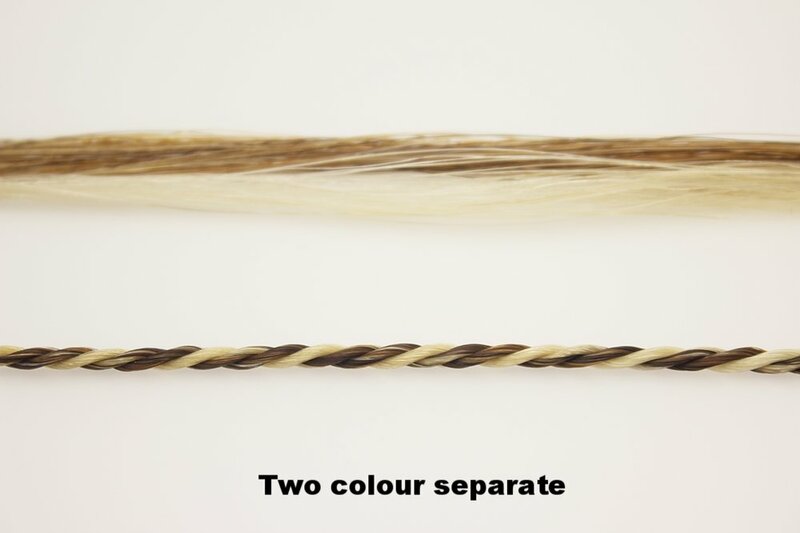 Horsehair is strong and resilient in its natural state and has been used for thousands of years in different applications due to its physical properties. What if I don’t have enough hair? If you don’t think the hair you have is enough there are options we can employ. For example, we can add hair if needed or modify designs to cope with shorter hair. If you have any concerns with the amount of hair available to you, you are welcome to give Damian a call or send through your hair for assessment. All unused hair will be returned in all cases. The blending of different colours can be done a number of different ways. The braids Damian makes are a three strand rope style. This gives the opportunity to use different hair for each strand if required or mixing hair within the strands. Some clients wish to retain as much individuality of colour as possible but unless specified, Damian aims to display the colours as individual yet with overall uniformity and balance. This is most challenging when mixing highly contrasting colours e.g. black and white. Below are Images of the more common two and three colour blends, using high contrast colours to showcase the effect. Half of each strand in each colour. Two strands purely of each colour while the third strand is half and half. Mix of even amounts of all three colours. Each strand a different colour. Desire a specific colour blend? If you require any particular colour mix or focus e.g. mainly black with a streak of white, or get as much of the lighter colour as possible, simply indicate your specific requirements in the notes at checkout.